A big "thank you" to a new ACA sponsor! Elio Bartolotta, owner of Elio Pizza on Fire and Elio Cafe, agreed to sponsor the ACA for the Mayor's Ball in Addison! This event is an all-community charitable fundraiser benefitting most organizations and groups in Addison. The ACA has participated and benefitted so much from this annual event, hosted by the village for the community. Bartolotta has been so generous as to donate toward electronic bidding in our name, and we are appreciative of his support! If you have not gone to Elio Pizzeria, you really need to go! Bartolotta also recently opened Elio Cafe at Farmwood Plaza in Addison. There you can get Italian crepes and tasty treats both sweet and savory! Go online to check out the live auction, and take advantage of some great items to bid on. Support the ACA, and check out Elio's! Thank you soooo much! Established in 1986, the DuPage Foundation is a public 501c3 organization to which contributions are tax deductible. It was created to benefit the people of DuPage County, and it receives contributions and bequests into a permanent endowment from individuals, corporations, organizations and foundations wishing to make lasting contributions to the people of DuPage. The earnings of these funds are then used, in accordance with donor wishes, for the Foundation’s grant-making and community leadership activities. The ACA has also received a grant from the The National Endowment for the Arts for the 2014 and 2015 seasons. The ACA receives additional support for our art program. This program is partially supported by a grant from the Illinois Arts Council Agency. These grants have helped underwrite the Arts Alive after school program, which we hope to continue for many years, thanks to the generosity of these grantors, as well as our other special presentations for children. The DuPage Foundation awards grant money to the Addison Center for the Arts. 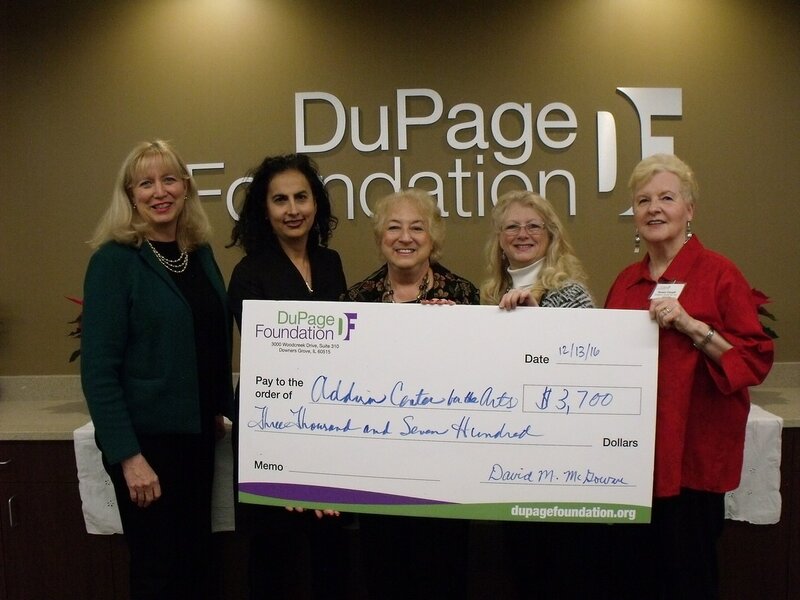 From left: Denice Gierach, DuPage Foundation Trustee; Supriya Jasuja, DuPage Foundation Grant Committee Member; Annette Leiber, Sara Ricci and Susan Cargill, Addison Center for the Arts Representatives. In July 2016, McMaster-Carr made a generous donation to the Addison Center for the Arts. We appreciate the continuous support from our sponsors. Thank you, McMaster-Carr!